Expectant mothers and new parents throughout Essex County gathered at Berkeley College in Newark, NJ, for the fourth annual Parenting Palooza on June 2, 2017. The event was co-sponsored by Berkeley College, Amerigroup, Horizon NJ Health, New Jersey State Federation of Women’s Clubs, and Project LAUNCH. The goal of the event, presented by the Essex Pregnancy & Parenting Connection, a program of Prevent Child Abuse – New Jersey, was to engage and share educational resources with the community’s new mothers and their families. Workshops pertained to topics ranging from nutrition to stress management. Mothers also participated in activities such as yoga and music classes, with their infant children. “Berkeley College was honored to host this event, and looks forward to building on this collaboration with the Essex Pregnancy & Parenting Connection to raise awareness about the resources available to expectant mothers and parents in the community we serve,” said Earl Brown, Berkeley College Campus Operating Officer, Newark, NJ. Attendees also had the opportunity to meet representatives from the New Jersey Department of Children and Families, the Zufall Health Center, the KinderSmile Foundation, Programs for Parents, the Essex County Council for Young Children, the Statewide Parent Advocacy Network, the Youth Consultation Service, the Partnership for Maternal & Child Health of Northern New Jersey, FAMILYConnections, the Youth Advocate Programs’ New Jersey Fatherhood Healthy Relationships Initiative, and the Newark Public Library. Photo Captions: (Top) Families throughout Essex County gather at Berkeley College in Newark, NJ, for the fourth annual Parenting Palooza on June 2, 2017. 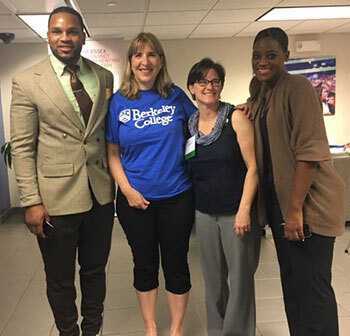 (Above, L to R) Earl Brown, Berkeley College Campus Operating Officer, Newark; Laurie McFadden, Director, Berkeley College Library, Newark; Karen Benjamin, Northeast Area Director, Prevent Child Abuse New Jersey; and Rayna Brown, Academic Advisor, Berkeley College, at the fourth annual Parenting Palooza. The Essex Pregnancy & Parenting Connection, a program of Prevent Child Abuse – New Jersey, is part of the New Jersey central intake initiative that connects Essex County families before and during pregnancy, infancy and early childhood to services in the community. The goal is to provide successful connections between families and services that promote health and safety. For more information, visit: www.EssexPregnancyAndParenting.org.